The range of rent performances among major U.S. apartment markets has narrowed, due in part to smaller increases among top performing metros. Top performing smaller markets, however, are still seeing large increases. Among the 50 largest U.S. markets, only four posted annual rent growth above 5.0% in 1st quarter 2018, with increases topping out at 6.7%. By comparison, each of the 10 top-performing secondary and tertiary markets posted increases of 5.4% or more, with five recording rent growth above 7.0%. 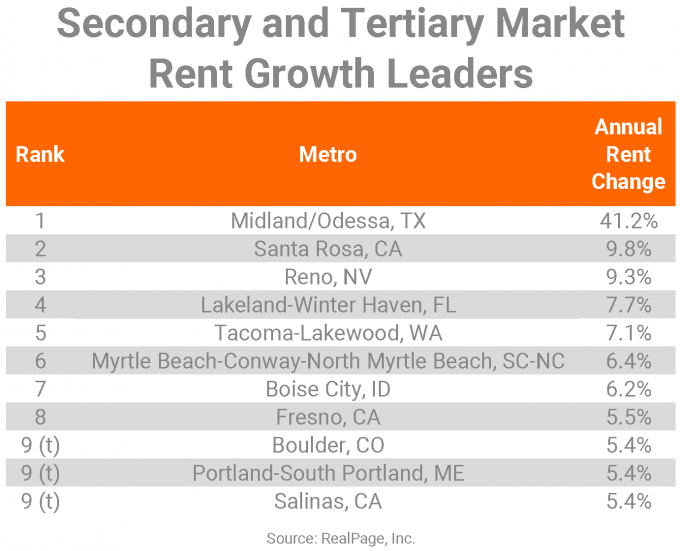 For the second consecutive quarter, the standout rent growth player was Midland/Odessa. The annual price increase in the Permian Basin was stunning at 41.2%. This is the second consecutive quarter that annual rent growth in Midland/Odessa’s apartment market registered above the 40% mark and the fourth quarter of annual price increases in the double digits. Apartment performance here tends to follow the boom and bust nature of the oil and gas industry, and right now job growth in that employment sector is on an upswing as the industry is recovering. Santa Rosa registered annual rent growth of 9.8% in 1st quarter, while Reno garnered increases of 9.3%. Price hikes in both of these markets has been pretty strong recently in comparison to local norms. In Santa Rosa, annual rent growth has averaged 8.1% in the past five years, well ahead of the metro’s long-term performance. Inspiring operators to push rents even further in the early months of 2018, occupancy has hovered near 98% – a 13-year high – for two consecutive quarters now. 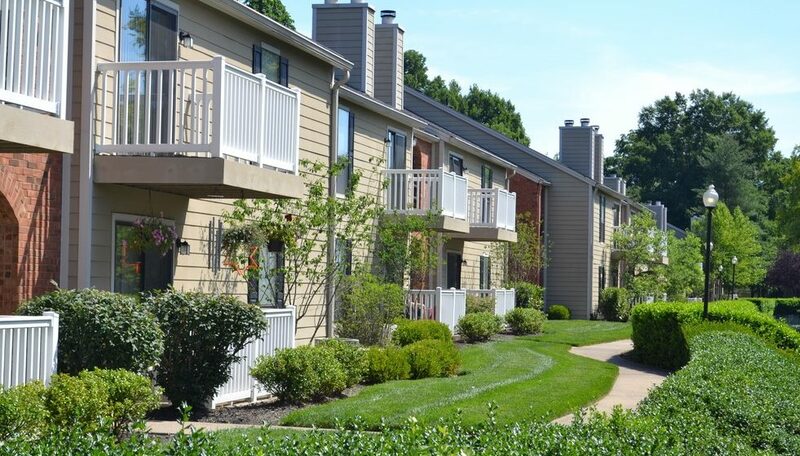 Santa Rosa is also the nation’s #2 market in occupancy, coming in just behind Salisbury, MD. Both occupancy and rent performances in Santa Rosa have strengthened in recent months, possibly influenced by the nearby wildfires in October 2017. Meanwhile, annual rent growth in Reno has averaged at 7.8% in the past five years, a strong performance relative to the metro’s long-term average. The 9.3% rent hike in 1st quarter 2018 continued the recent momentum, though that rate is down from the peak of 12.5% achieved in 3rd quarter 2017 and from the 10%-plus showings from much of the past seven quarters. Similarly, occupancy in Reno is tight at 96.4%, well ahead of the long-term local norm, but down from the recent peak of 97.5% seen in 3rd quarter 2017. Reno’s economy recorded notable expansion recently, placing the metro second only to Odessa in job base expansion in recent months. Lakeland-Winter Haven and Tacoma recorded annual price increases between 7% and 8% as of 1st quarter. This rent growth showing in Lakeland registered more than 500 basis points ahead of the long-term local standard and marked the 30th consecutive quarter of annual price increases for the Florida market. Lakeland-Winter Haven was also a national top 10 performer for occupancy, with an early 2018 rate of 97.1%. In Tacoma, price increases have been registering well ahead of the market’s decade average of 3.4%. In fact, the 7.1% increase in 1st quarter marks the West Coast metro’s 11th consecutive quarter of annual price hikes over the 7% mark. The economic base is healthy in this market as well. Though knocked out in the early months of 2018, Tacoma was a top-10 performer for job base expansion in 2017. Registering annual rent growth just above the 6% mark were Myrtle Beach and Boise City. Price increases have been erratic in Myrtle Beach recently, getting as high as 8.5% in 2nd quarter 2016 and as low as 1.5% as recently as 3rd quarter 2017. Boise City, on the other hand, has seen relatively stable increases between about 5% and 8% for the past 12 quarters now. A handful of metros logged annual rent growth between 5.4% and 5.5%, including Fresno, Boulder, Portland and Salinas. California markets Fresno and Salinas saw their employment workforces expand at nation-leading rates in recent months. Just missing the top 10 list were Vallejo/Fairfield/Napa, Palm Bay-Melbourne-Titusville, Ann Arbor, Eugene, Huntsville and Tucson, with price hikes between 5.0% to 5.3%.